– A man and a woman marry and about five years later we see that they have a young son and young daughter. A man and a woman hug briefly. A man kisses a woman on the back of the head briefly. 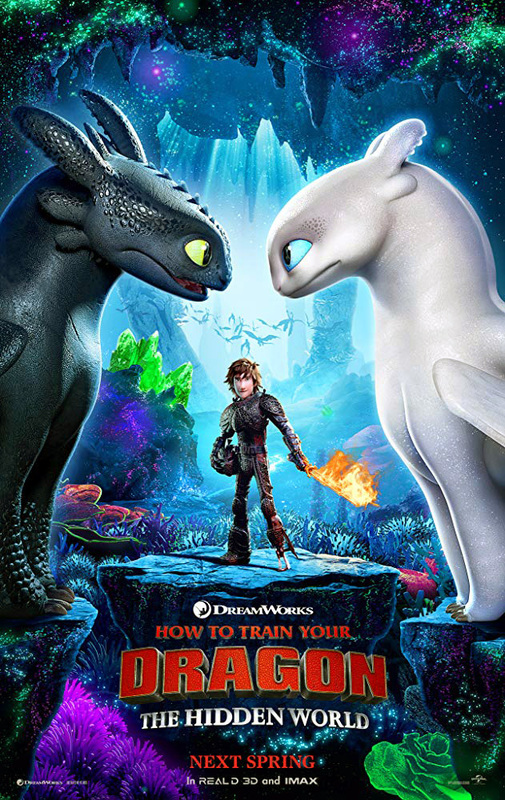 ► A male and a female dragon chortle, dance and rub heads together (they apparently mate off-screen and in a scene five years in the future, we see three baby offspring). A male dragon and a female dragon meet, she snarls and then they flirt, chortling; she then raps him on the head after he does a twirling dance that makes him look like an umbrella, he hops up and down on a tree branch and falls to the ground where he uses the broken branch to draw the female’s face in the sand. A male and a female dragon fly together and then soar in a high-flight sequence among clouds. A pair of small dragons dance on one foot and rub their heads together in a mating dance (no mating or offspring are seen). A man says that a male dragon is love-crazed. - A kingdom includes thousands of dragons and a like number of fierce-looking Viking men and women; many Viking men are shown wearing animal skins and some have long sharp horns on their helmets, and one man has an artificial lower leg made from a metal loop and another man has a short wooden peg leg and a big wooden spoon in place of one arm. Dragons are shown in a range of colors with some having many spikes on their heads and backs, some with lopsided faces and many have sharp teeth; a huge dragon has wide horny plates on its head and another dragon has tendrils on its upper lip to look like a mustache of snakes; Vikings ride on the dragons' backs and save other dragons that are being held by dragon poachers. ► Two men struggle and one unfastens his metal leg that the other was clinging to and he falls into the water (he is not seen again and is likely dead). Thick fog covers several pirate ships and we see pirates poke dragons with long sticks, muzzle them and place them in cages until dragon riders arrive and use a flaming sword, plain swords, axes, maces and lances to battle the pirates; a few dragons breathe fire as men clang weapons together and a few men fall into the sea and from one deck to a lower deck (no injuries are seen), and a man and a dragon each run headlong into a wooden pole and sink below the frame; the captive dragons escape with all the dragon riders unharmed. Pirates swing clubs and hit large dragons and the dragons look angry; a poacher fires a crossbow bolt into a large dragon that falls dead (no blood flow and we cannot see the injury). ► Three dragons break through a roof and spew large amounts of slime acid (no one is hurt); the dragons have stabbing scorpion tails and aim at people a few times (no one is hurt) and a Viking collapses as fires break out throughout the house and spread to the village as the poacher escapes through the fires and we see tall flames and burning buildings in the night; two men walk through fire and are not burned, but they cough several times from the smoke and one man gathers the villagers and dragons to find safety. ► Several Vikings in battle armor go to a poacher's lair where dragons spew acid to create fires and smoke in several places (no one is harmed), and the poacher fights a Viking who has a flaming sword and the Viking escapes, jumping across a gulf of fire and onto the back of a dragon that flies away; the other Vikings also escape as we see a brief rock slide occur because fires have burned away support structures in the lair. A poacher ambushes a group of Vikings and captures two dragons putting them in chains and muzzles and carries the animals hanging upside down in a flying wooden vehicle and the poacher threatens to kill the female if the Vikings retaliate or try to protect the rest of their dragons. A man, a woman and a dragon fly down through a waterfall to find a glowing world of neon stalactites, clouds, a swarm of small firefly dragons as well as thousands of large and small dragons; a huge dragon confronts the humans, chases them and roars and flocks of dragons chase the humans as they escape with a dragon that takes them home. A woman riding a dragon is attacked by three large dragons and escapes, arriving at her village looking bedraggled. A woman and her dragon are captured, but she irritates her captor with incessant talking so he lets her go and follows her. ► A dragon emits blue lightning bolts that shoot at five dragons to make them fall into deep water; a dragon is freed, another is drugged with a dart, and another with a Viking pursues a poacher, who tranquilizes the dragon midair with a dart and it falls toward the ocean (please see the Substance Use category for more details). Vikings flying with wingsuits confront a pirate fleet and start a battle where we see many clashes between men and women using swords, a fire sword, lances, poles, maces and axes; many people fall (with no blood shown) a woman tosses a smoking grenade and a man tosses something to make the grenade explode in smoke and flames as a dragon flies through a ship's mast, destroying it and the remaining fleet breaks apart into splintering wood and sinks. ► A large man confronts a smaller man until a dragon grabs the large man and flies away with him. A line of archers point arrows at a poacher in a mechanical flying craft and then lower their weapons. A man finds a large dart in some grass and then discovers a loudly snapping dragon trap (no one is caught in the trap) and later a poacher shoots a drugged dart into a dragon. A dragon is used as bait to capture another dragon. ► A male character screams about demons when he sees small creatures with tiny wings and large fangs; he sees them several more times, suddenly increasing in numbers until 100 of the creatures flying in the air chase pirates off-screen and off a ship snapping their teeth at the men. Dragons breathe fireballs in several scenes without doing harm, but a dragon in the woods spits fire that burns a large hole in an old tree. A dragon breathes fire and accidentally singes a Viking's moustache and it smokes a little. In a dark sky where we see lightning and hear thunder, two dragons fly together, spitting fireballs and disappearing in them. A dragon emits blue lightning bolts and disappears into them for a few seconds. ► A large dragon knocks down a totem pole that bounces off a roof and into the sea. A few dragons snarl and roar several times and one dragon with large sharp teeth roars toward the audience. A dragon falls and rolls down a hill of sand, unharmed. A man makes a mechanical tail for a dragon. A woman slams an axe blade into a wooden table. ► In several scenes a poacher says that all dragons are bad and should be killed and a younger man disagrees loudly with him in one scene. A flashback shows a now-deceased man giving advice to his young son as he is tearful and mourning the death of his wife. After years of living with Vikings in peace, a flock of dragons leaves the community to live in a hidden dragon world and most of the Vikings become tearful and look sad. ► A dragon slobbers several times, including over the face of a man, into a paint pot, and all over a prosthetic leg it catches as the owner throws it for a game of fetch. A young boy has whitish mucus under one nostril. A woman points to her buttocks and asks where the bathroom is on a pirate ship, but she is told to just get off the ship. A woman picks her teeth with a fingernail for several seconds. A man makes a buzzing mouth noise in frustration. A small dragon swims in a cauldron of bubbling gruel as other dragons roll all over food on long dining tables as Vikings try to eat. - A man uses a purple serum made from venom for brainwashing and hypnotizing dragons and a tranquilizer dart to render a dragon unconscious three times and it falls out of the sky, and a man says that his dragons are under the serum's influence and we see that their eyes look dazed. Two party scenes show men and women drinking something unknown from metal and wooden cups that look like beer steins, and a man pours something unknown to drink from a bottle into a goblet in a home and drinks it. - Growing up, friendship between diverse individuals, battling enemies in cooperation with close comrades, danger, fear, courage, war, artificial limbs, bigotry and racism, genocide, poaching, selfishness, animal rights, protecting others, saving the world, responsibility, accepting change, saying goodbye, family, love, joy, sadness, anger. - Part of growing up is allowing loved ones to pursue their own lives.